Cranborne Audio is very proud to announce Camden EC2; a two channel 19" rackmount preamp, "Mojo" signal processor, and dual headphone mixer based on the award winning Camden 500 preamp. Featuring two discrete instances of Cranborne Audio’s groundbreaking ‘Camden’ preamp with the same Mojo analogue saturation circuit that engineers and musicians the world over have fallen in love with, Camden EC2 achieves stunning low-noise and low-distortion performance as well as frequency and phase linearity at all gain settings. Combined with Cranborne Audio’s custom Mojo analogue saturation circuit, Camden EC2 can take on the persona of a vintage british-style transformer-based preamp using Thump, a gooey tube-based preamp using Cream, or an astoundingly clean and natural preamp when Mojo is bypassed. Switch each Camden preamp into their line mode and the Mojo saturation circuits can apply vintage colouration onto stereo stems during the mix phase. Packaged into a flexible and standalone 1U 19” chassis and featuring two reference-quality headphone amplifiers with discrete line mixers and independent CH1, CH2, and Aux Input level controls, Camden EC2’s reference-quality headphone outputs can be used during mic placement to help find the sweet spot of a guitar cab, kick drum, or acoustic instrument. Alternatively, they can be configured to create a zero-latency all analogue monitor mix combining the local Camden preamps with playback incoming from an external playback source. Camden EC2 utilises Cranborne Audio’s unique C.A.S.T. system for distributing audio around studios by repurposing the internal copper wires of a Cat 5 cable to transport balanced analogue audio to and from other C.A.S.T. enabled products. Connected to the C.A.S.T Inputs of another C.A.S.T. 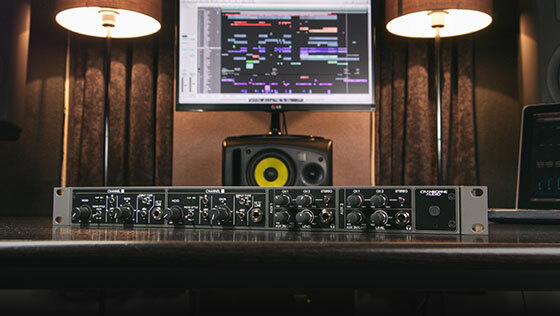 enabled product, Camden EC2 can send its preamp outputs directly into the inputs of the connected device whilst simultaneously receiving a monitor mix to monitor using Camden EC2’s Aux 1 headphone mixer. Much more than two Camden 500’s in a metal box, Camden EC2 is is a unique high performance professional, project, and home studio solution. The Camden is EC2 is manufactured in the UK under the team’s watchful eyes, whilst providing elite audio specifications and application-based features that deﬁes its price tag - making it accessible for all professional, project, and home studio engineers. The Cranborne Audio Camden EC2 will be available in Q2 2019 with an pricing to be confirmed.